I heard about this on Twitter the other day and just had to let you know about it. BeautyMART is a new beauty department within Harvey Nichols. Created by Anna-Marie Solowij (ex-Vogue beauty director) and Millie Kendall (of Ruby and Millie fame), it showcases the best bits from over 100 brands (think Bioderma, EOS, Glam Glow, Japonesque). I've visited the Beauty Mart in the Knightsbridge store several times since launch and have loved it every time (review here). You can imagine how happy I was when I heard that they were expanding even more and were launching a BeautyMART vending machine on the 4th floor of the Knightsbridge store. 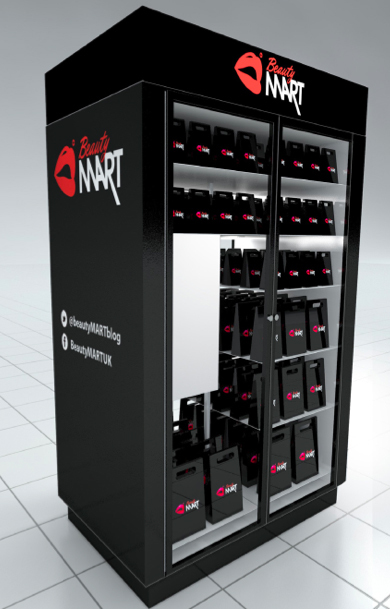 Yes, that's right, a beauty product vending machine! Launching today, the vending machine is stocked with beauty bags containing kits and quick pick items ranging in price from £3.45 right up to £98, so there's something for everyone. Example bags include: a Love and Peace bag for Christmas with a Jurlique Love Balm and Nadia Narain Peace Candle, a Fashion Emergency bag with Miss Oops Mishap Tape and Rescue Sponge, a Clubbing Kit with Bourjois Volume Clubbing Mascara, Model's Own Wah Nails Nail Transfer in Cuboid (a gold and black geometric design) and mini Batiste Dry Shampoo and a Vintage Glamour bag with Eyelure false lashes and red lipstick. There are also bags with single products that include, for example GlamGlow - £50, Kahina Argan Oil - £74 and Elizabeth Arden 8 Hour Cream - £25. I think this is a really fun concept. I will be off to Harvey Nichols very shortly to check this out in the flesh and will report back afterwards. Let me know your thoughts - would you like to see vending machines like this popping up all over the country? *This is not a sponsored post, I just wanted to share the news with you as quite honestly, I squealed with glee when I saw this on Twitter!! I know - I can't wait to get down there and buy something out of it! i wish i lived where there was one of these! Its such a great idea!! Would you be able to take a look at my blog? I hope there will be many more of these! check out my bog to see how to enter two giveaways!